Are you settling for a tolerable workspace? 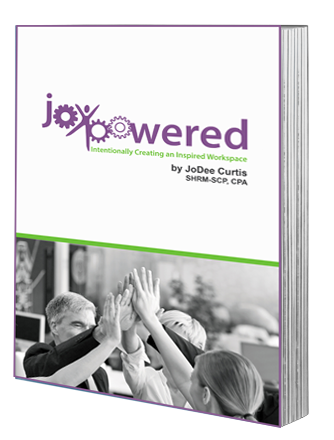 JoDee Curtis, SHRM-SCP, CPA, Founder of Purple Ink, challenges you to make yourself and your workspace JoyPowered™! Find out how to create a dynamic and inspired workspace by focusing on strengths instead of fixating on weaknesses. JoyPowered™ helps organizations and individuals understand how to structure their relationships and environments to focus on their strengths, bringing out the best in others and themselves. A healthy work culture doesn’t have to start at the top; an inspired workspace starts with YOU! The eBook version of JoyPowered™: Intentionally Creating an Inspired Workspace can be purchased for $4.99 via Amazon. You can buy a full print copy of JoyPowered™ for $12.99 plus tax. Click the "Buy Now" button below! Interested in learning more about being JoyPowered™ in both your workspace and your family life? Click the button below to buy both books for just $20!